Summit Fever is a mountaineering book with a difference. 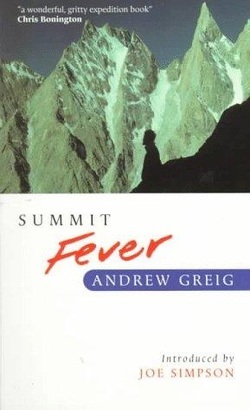 It gives both a full account of the successful ascent of the Mustagh Tower in 1984 by previously little-known British climbers, and a dramatic description of the author's own feelings and experiences as a novice climber on a full-blown Himalayan expedition. The reader follows him through his preparations, the problems of adjustment, the last-minute negotiation of financial and bureaucratic obstacles, the joys and hazards of the approach route from Rawalpindi through Baltistan. Andrew Greig depicts vividly the stark and hostile beauty of the highest mountain range in the world as well as the warm fellowship at Base Camp and above. His candid but affectionate portraits of the members of the team go a long way towards answering the inevitable questions of why climbers climb and, with his engaging tone and great writing skill, make this an exceptional travel book for a wide readership. Summit Fever was shortlisted for the prestigious Boardman-Tasker prize. It is published by Canongate. To find out more about the book and the publisher, please click HERE. To read a review of the book, click HERE.